NOTE: This is the first installment of what we intend to become a worldwide reference on rail-airport links. The primary advantages of rail access are (1) trains bypass roads that can become snarled in rush-hour traffic, (2) rail access is often the least expensive option and (3) at some remote airports, rail is much faster than any other alternative. Local transit cars are not designed to serve travelers with baggage and likely to be very crowded at rush hours. Light rail, electric, providing frequent all-week service, often involving some street running, with either low or high platforms–or sometimes both, some using zone pricing but most using one-price system wide rides, typically running through a city center and stopping on streets with no adjacent traveler facilities. Heavy-rail metro, electric, providing frequent all-week service, with dedicated right of way and uniform high-platform loading and unloading, making fewer stops than light rail, some using zone pricing but most using one-price system wide rides, typically running through a city center and stopping at elevated or subway stations with no adjacent traveler facilities. Heavy-rail commuter, electric or diesel, providing frequent weekday service at commute hours but less frequent to no service off-peak, making fewer stops than metro, faster than metro and usually less frequent than metro, often loading from low platforms through stairs that are tough to handle with baggage, usually priced by distance, often with peak/off-peak variation, usually running to a city-center terminal station with traveler facilities. Amtrak intercity rail, electric or diesel, usually making infrequent airport stops and fewer overall stops than commuter, and often more expensive than commuter. Unless otherwise stated, vehicles used in airport services do not have dedicated traveler baggage racks. Using public transit with baggage may present a major hassle and may require standing during busy times. This report is prepared from the point of view of a nonresident who is unfamiliar with local transit options–maybe on a first visit. We post the regular fare for travelers of any age. Most systems have converted from cash and tokens to use of stored-value tickets obtained from vending machines. These machines typically accept cash, debit cards and credit cards; they offer multiple pricing options requiring some study before boarding the system. Most North American systems offer senior discounts which require proof of age. Unless otherwise noted, the minimum age for senior discounts is 65 and Medicare cards are accepted as proof. Rather than offering youth fares, most systems key youth discounts to local student status. We show taxi fares as a cost comparison. Almost all of the listed airports also offer fixed-route bus access, often to multiple zones or areas, and on-demand door-to-door shuttles. Details are available on each airport’s website. Basics: The airport rail station is integrated into the main air terminal. Atlanta’s heavy-rail metro red and gold lines operate frequently to the central business district (15 minutes) and beyond. It’s an attractive alternative to the city center or areas to the north. Fares: $2.40 single trip; children under 46 inches tall ride free; seniors age 65 or over pay $1. Taxi fare is flat-rate, $30-$32 to city center. Basics: The light rail airport station is immediately adjacent to Concourse E of the air terminal. The Light rail system operates frequent trains to the city center (40 minutes). It’s a reasonably good alternative to the city center. Fares: $1.50 single ride, 55¢ seniors 65 or over. Taxis are metered, about $35 to downtown Baltimore, $90 to downtown Washington. Basics: The heavy-rail BWI station is an extended shuttle bus ride from the airline terminal. MARC commuter trains operate infrequently from the BWI rail station to Baltimore Penn Station (25 minutes) or to Washington Union Station (40 minutes). Weekday trains operate hourly except at commute times, only 9 trains operate on Saturdays and 6 on Sundays. MARC is more useful for travel to Washington or suburbs north of Baltimore than to the city center. A few Amtrak trains stop at the BWI rail station, mainly for service to Wilmington and Philadelphia. Fares: $4 to Baltimore Penn station, $6 to Washington Union Station, seniors age 65+ pay 50 percent, show your Medicare identification. Basics: The Blue Line metro airport station is an annoying shuttle bus ride from individual airline terminals. Frequent metro trains run to the central area (about 15 minutes). Frequent Silver Line bus rapid transit goes from individual airport terminals to South Station. MTA is a good choice if your Boston destination is downtown or the waterfront, or to other areas requiring only one change. See Providence for other Boston area service. Fares: Regular fare $2.65 ($2.10 with stored-value Charlie Card), seniors 65 or over pay $1.05 with prior locally-issued identification card. Silver Line bus is currently free inbound from the airport. Taxis are metered, around $20 plus tolls ($7.50) and tip. Basics: The airport rail station is a long walk from the airline terminal. Metrolink commuter trains operate infrequently to Union Station (25-35 minutes), with only one daily train on weekends. Union Station is not near major hotels and offices. Rail is only marginally useful in Burbank. Fares: $6.75, seniors 65 or over pay half fare, youth age 6-18 pay 75 percent of regular fare. Taxis are metered, about $50 to downtown Los Angeles. Basics: The airport L station (metro) is immediately adjacent to the main domestic terminals. Frequent trains run to Dearborn Street subway stops in the Loop (40 minutes.) The Blue line provides no direct service to the hotel concentration in the Near North side. Although the L isn’t designed for travelers with baggage, avoiding rush-hour traffic congestion on the Kennedy Expressway can be a big advantage. Fares: Regular fare $5 (premium for airport service), seniors pay $1.10 with previously-issued RTA senior identification. Alternatives: Taxis are metered, about $60 plus tip to the Loop or Near North. Basics: The Metra “O’Hare Transfer” station is a long people-mover plus shuttle bus from the air terminals. Metra operates infrequent heavy-rail commuter trains to Union Station (35 minutes) and to a string of suburbs to the north. This rail service is more useful for travelers heading to northern suburbs than to downtown Chicago. Fares: $2.25 to Union Station. Basics: The Midway metro station is integrated into the main passenger terminal. Frequent L trains run to Loop “L” line stations (25 minutes). The Orange line provides no direct service to the hotel concentration in the Near North side. Fares: Regular fare $2.25, seniors pay $1.10 with previously-issued RTA senior identification. Taxis are metered, about $40 plus tip. Basics: The airport rail station is integrated into the passenger terminal; the first to be built in the US. Frequent trains run Tower City (25 minutes) and on to the east side. Fares: Regular fare $2.25, seniors pay $1.00. Taxis are metered, about $15 plus tip. Basics: The light rail airport station is immediately adjacent to Terminal A, which requires using Skylink people-mover (inside security) or Terminal Link shuttle bus (outside security) from other terminals to Terminal A. Light rail trains run to the core light-rail route in the city center (about 50 minutes). Fares: Regular fare $2.50; $1.75 from 9:30 to 2:30; seniors 65 or over pay $1.25. Alternative: Taxis metered, about $60 plus tip to Dallas; about $70 plus tip. Basics: The Trinity Railway Express “DFW Airport” station is seven-mile shuttle trip from the air terminal. TRE commuter trains run to Dallas Union Station (30 minutes) and Ft Worth T&P Station (30 minutes). Running time is 30 minutes either way. Trains run frequently during commute times, less than hourly midday, and not at all on Sundays. TRE is most useful to Ft Worth, which has no other rail option. Fares: Regular fare $2.50, seniors pay $1.25. Basics: The newly opened A heavy rail line operates every 15 minutes between a station in the Airport terminal and Union Station downtown, with connections to other transit lines. The trip takes 37 minutes. The new rail system is a big improvement for Denver’s airport, which is a long way out of the city center. Fares: $9 each way to the city center; seniors pay 50%. Basics: A seven-mile shuttle bus trip connects the air terminal with a TriRail airport station. From there, TriRail commuter trains between Miami and West Palm Beach run hourly at midday, more frequently at commute hours, stopping at main South Florida cities along the way. The stations at coastal cities are several miles West of the city centers and beach areas. Fares: Based on distance and time, sample regular fare $5 to Miami, seniors 65 or over pay 50 percent. Basics: The Green Line rail stop labeled “Aviation/LAX” is a three-mile shuttle bus ride from the airline terminals. Light rail trains operate frequently between El Segundo and Norwalk. But calling this station an “airport” stop is a stretch. The Green Line doesn’t go anywhere near the city centerl; instead, you have to change to the Blue Line. Running time to downtown about 45 minutes plus connecting time. This is too much schlepping. LA is building a new light rail route that will serve the airport directly, but it won’t open for several years. Meanwhile, except for total rail buffs, fuhgeddaboudit. Fares: Regular fare $1.75; seniors 62 or over pay 75¢ at peak times, 35¢ at other times. Taxi: Flat rate, $52.50 plus tip. Basics: A people-mover connects the air terminal with a centralized ground transport center. Metrorail offers frequent metro service to downtown Miami, where it connects with the local people mover circulator system. But Miami’s rail network does not reach Miami Beach or the cruiseport at all. Fares: Metrorail: Regular fare $2.25; seniors 65 or over pay $1.10. Taxi: Metered, about $30 to downtown or cruiseport, $35 to South Beach. Basics: An eight-mile mile shuttle bus trip connects the air terminal with the TriRail Hialeah station. From there, TriRail commuter trains run north to West Palm Beach, hourly at midday, more frequently at commute hours, stopping at main South Florida cities along the way. The stations at coastal cities are several miles West of the city centers and beach areas. Tri-Rail will eventually reach the airport’s centralized ground transport center, but problems with street closures have delayed the project. Basics: Amtrak’s airport stop is a two-mile shuttle bus trip from the airport terminal. 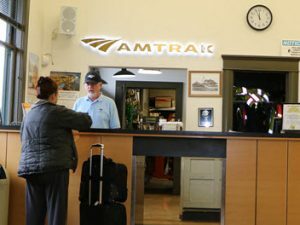 Amtrak operates Hiawatha service intercity trains, with seven daily round-trips trains (six on Sundays) nonstop to central Milwaukee (15 minutes) and two-stop to Chicago’s Union Station (1:20). This service is occasionally useful to Chicago travelers when fares to Milwaukee are lower than to Chicago airports. Fares: Regular fares to Milwaukee, $7.50, seniors pay $6.37; to Chicago, regular fares $24, seniors pay $20.40. Taxi: Metered, about $30 to downtown Milwaukee. Basics: Frequent light rail service operates from stations at Terminals 1 and 2 to downtown Minneapolis; the light rail system also serves for interterminal transfers. The light rail does not go to directly to St. Paul (change trains at downtown Minneapolis). Fares: Regular fare $1.75 off-peak, $2.25 peak, seniors 65 or over pay 75¢ off-peak, $2.25 peak; interterminal transfer free. Taxi: Metered, about $35 downtown. Basics: The JFK AirTrain people mover operates from stations at each major airport terminal to Jamaica Long Island Rail Road station. From there, Along Island Rail Road commute trains operate frequently to Penn Station (20 minutes) and Brooklyn, as well as to stations throughout Long Island. Alternatively, E line subway lines run from Jamaica station to the Eighth Avenue subway line in midtown and the J line runs on the Nassau Street line downtown (35-45 minutes). Also alternatively, the AirTrain also operates to the Howard Beach MTA station for the A subway line to Queens, Brooklyn and Manhattan (40-60 minutes). To the West Side of Manhattan or Brooklyn, the AirTrain-Long Island route is a no-brainer, avoiding the City’s notorious tunnel and crosstown traffic hassles. The rail options aren’t as good to the West Side, which requires at least two train changes and a lot of schlepping. Fares: Best service, AirTrain plus Long Island to Penn Station, regular fare $15.50, seniors pay $10.25. Cheapest service: AirTrain plus subway, regular fare $7.50, seniors pay $6.25. Taxi: Flat rate to midtown Manhattan, $52 plus toll ($5.50 to $8) plus tip. Basics: AirTrain People mover operates from stations at each major airport terminal to Newark Airport station on the Northeast Corridor main line. From there, New Jersey commuter trains operate to Newark and New York Penn Station (30 minutes), as well as to many northern New Jersey cities. A few Amtrak strains stop at the airport station, but trains are infrequent and fares are considerably higher than on NJT. For most travelers, this is a no-brainer; you get into Manhattan quickly and can catch a cab from Penn Station to wherever you’re headed. Fares: Regular fare to Penn Station, $12.50, seniors 65 or over pay $8.75. Basics: A new people-mover connects the airport terminal with the Coliseum BART station. From there, frequent BART commuter trains run to downtown Oakland (30 minutes), downtown San Francisco (40 minutes), and other Bay Area centers. Fares based on distance: $7.85 to downtown Oakland, $10.05 to downtown San Francisco; seniors 65 or over get 62.5 percent discount. Taxi: Metered, about $40 to central Oakland, $70 to downtown San Francisco. Basics: SEPTA airport stations are immediately adjacent to terminals E/F. C/D, B and A. From there, commuter trains run every half-hour to several stops in the city center (30 minutes) and beyond. It’s an attractive service. Fares: Regular fare $8 peak, $7 off-peak, seniors pay $1. Taxi: Metered, about $35 to downtown. Basics: The Sky Train people mover runs from airport Terminals 3 and 4 to the PHX station light rail station. From there, trains run frequently to downtown Phoenix (15 minutes) and to Mesa. But the light rail system does not serve the popular Scottsdale visitor centers. Fares: Regular fare $2; seniors 65 or over pay $1. Taxi: Metered, about $12 to central Phoenix, $25 and up to Scottsdale resorts. Basics: The MAX airport station is immediately adjacent to the air terminal. Light rail trains run frequently to downtown (40 minutes) and Beaverton. Many train cars have low floors for easy loading. Fares: Regular fare $2.50; seniors 65 or over pay $1. Taxi: Metered, about $35 plus tip downtown. Basics: Boston’s MBTA commute trains on the Providence line stop at an airport station connected to airport terminal by moving sidewalk. Trains operate to Providence (15 minutes) and on to Boston (85 minutes). But weekday trains operate infrequently, five in the early morning, six during remainder of the day; no airport service on weekends or holidays. This rail system is most useful to travelers headed to Boston who are lured to Providence by low airfares. Fares: Regular fares $6.25 to Providence; $11.50 to Boston; seniors 65 or over pay 50 percent with a previously issued MBTA identification card. Basics: The light rail station is immediately adjacent to the airport’s Terminal One. TRAX Green Line light rail trains operate frequently to downtown (20 minutes) and beyond. But the light rail lines do not serve main local or regional ski centers. Fares: Regular fare $2.50; seniors pay $1.25. Taxis: Metered, about $20 downtown. Basics: The airport BART station is part of the International Terminal; travelers from other terminals reach it by people-mover. Commute trains run frequently to central San Francisco (30 minutes). BART trains also shuttle to Millbrae station, for transfer to CalTrain suburban service to Peninsula suburbs and Silicon Valley. BART is a reasonably good option. Fares: Fares are zoned; regular fare to downtown San Francisco is $8.65; seniors 65 or over pay $3.20. Taxis: Metered, $50 plus tip. Basics: The airport rail station is connected to the terminals by a walkway. From there, Central Link Light Rail trains operate frequently to the downtown Transit Tunnel (35 minutes). Fares: Regular fare $2.75; seniors 65 or over pay 75¢ with reduced fare permit obtained in advance. Taxi: Metered, $45 plus tip. Basics: The South Bend Airport rail station is immediately adjacent to the air terminal. NICTD operates five commuter trains daily between South Bend Airport and downtown Chicago (2 hours, 15 minutes). Trains do not stop anywhere else in South Bend, but they stop at a handful of intermediate cities. This is a strange operation: We include it because the airport does, in fact, have a rail station, but the rail system doesn’t serve the city at all, so we presume that most users are folks heading to/from Michigan City, Gary, Hammond and nearby points. Fares: Regular fare to Michigan City, $6, seniors pay $3; to Chicago, $11.75/$5.75. Basics: Airport rail stations are immediately adjacent to Terminals 1 and 2. From there, Red line light rail trains operate frequently to downtown St. Louis (30 minutes) and on to Belleville, Illinois. Fares: Regular fare $2.50, seniors pay $1.25 with locally issued Reduced Fare Pass. Basics: The airport rail station is connected to the air terminal. From there, Canada Line operates frequent automated metro trains from an airport terminal to the city center and the waterfront-cruise terminal area (26 minutes). Fares: Regular fare, $C2.75, seniors pay $1.75C with proof of age. Taxi: Metered, $C35 plus tip. Basics: The airport rail station is connected to the main terminal by short pedestrian bridges with a moving walkways. From there, Blue and Yellow Metro lines operate frequent trains to various parts of the District, including the K Street corridor and the Mall area (10 minutes), with easy connections to other lines. All Metro stations provide elevator or escalator access between street and platform levels. The system is building a link to Dulles Airport, but it won’t be finished for several years. Fares: Vary by zones and time; regular fare to l’Enfant Plaza $2.25 peak, $1.85 off-peak, with a stored-value farecard; occasional users pay an extra $1 for a one-use paper ticket. Seniors 65 or over pay half the peak fare, but only with a SmarTrip stored-value farecard, not available at the airport but available at a handful of sales offices. Taxi: Metered, about $15 to center. Basics: A four-mile shuttle bus trip connects the air terminal with a TriRail airport station. From there, TriRail commuter trains run south to Miami hourly at midday, more frequently at commute hours, stopping at main South Florida cities along the way. The stations at coastal cities are several miles West of the city centers and beach areas. Fares: Based on distance and time, sample regular fare $5 to Boca Raton, seniors 65 or over pay 50 percent. Airports where rail access is under construction or firmly planned include Denver, Los Angeles, Honolulu, Orlando, Toronto and Washington/Dulles. Toronto’s link to Union Station should open later this year: the others are anywhere from two to 10 years away. Several other airports/cities are in early planning stages, but completion is at least a decade in the future, if ever. Sacramento, Calif. and Phoenix, Ariz.